There was some debate about whether or not Bynum would be re-signed during the offseason, but the connection he had with Drummond made any moderate contract offer a safe investment. Bynum struggled with consistency last season. He would go through stretches of dominance, running the offense and putting stress on defensive units, but would then turn the ball over on three straight possessions and get benched for the rest of the game. You could tell that his mind was working faster than his body allowed. But for a backup point guard, he was exactly what teams are looking for: instant offense that can give you 15 minutes a game and keep the offense running in lieu of the starters being on the bench. 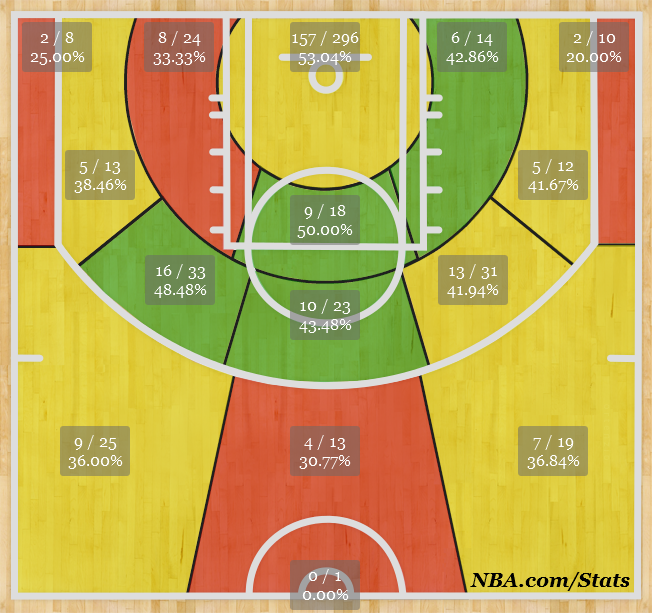 Defensively, Bynum isn't even much of a liability. That could be because he was almost exclusively on the court with Drummond, but there he doesn't get exploited like, say, Nate Robinson does. Unfortunately, the Pistons' guard rotation became muddled when the team signed Chauncey Billups during the offseason. Mo Cheeks is intimating that Bynum will spend time on the bench in favor of Rodney Stuckey, but for a player who never excelled at point guard, it's hard to see Stuckey holding off Bynum for long. Besides, you can only silence the Bynum-to-Drummond connection for so long. While Cheeks figures out the rotation early in the season, Bynum will probably spend more time on the bench than he deserves. But as the roster situation shakes out (read: players get traded), playing time for Bynum will open up. When it does, expect Bynum to give the team basically what he did last year: instant offense and some unfortunate turnovers for 10-15 minutes a game. The good news is that the Pistons have viable depth in the backcourt, depending on your feelings about Stuckey and Billups. Having a player like Bynum as a reserve guard shows how much talent the Pistons have on the roster. Bynum could potentially be traded to a contender, but it's more likely that he resumes his role as the backup PG as the season progresses. Injuries to Billups will hinder his effectiveness and I still believe that Stuckey won't finish the season in a Pistons uniform. Early in the season, Bynum will be an insurance policy, but by the midpoint, he'll be getting significant minutes backing up Brandon Jennings.